Why do the two high amplitude forehands (Nadal and Djokovic) dominate the ATP tour? Looking at the current world rankings, Nadal is 12500 pts, Djokovic is at 12330. Then there is a precipitous drop in points, with Wawrinka at 5525, Federer at 4945. Why would there be such a drop? I attribute this to the simple fact the prior two have more topspin and sidespin on their forehands. Let's be honest here. The serve is no longer the determinant of success on tour. If it were, Raonic and Isner would be in the top five. And the other matter is that more U.S. men are neglecting what should be obvious. To win consistently above the rest of the field, one needs a versatile topspin forehand. 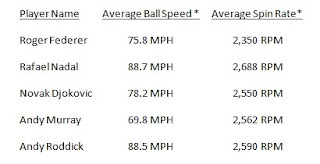 Well, we have here Nadal, Djokovic and Roddick with the highest RPMs and ball speed. But why would one choose Nadal and Djokovic's forehand above Roddick's or Federer's? The answer would be control of sidespin. The ability to hit sidespin, due to the conservative Western grip would explain the top 2 players in the world's stranglehold on the tour. Sure, they will lose a match here and there, and it's a temporary shocker when it happens. But in the course of time, who do we see in the finals. Both or one of the two. It used to be that Sampras with his high RPM serve would dominate the tour, backed by his volleying skill. Now, it is the inside out forehand and the ability to control the rally. Year after year, I see juniors drive the ball in search of the big strike forehand which elicit oohs and aahs from their parents and coaches. But I don't see a steady consistent kid who will eventually do what Djokovic and Nadal can. Hit a steady rock solid forehand which will get the ball in consistently and with creativity. @Tim Prapong. Hoepfully they will improve their techniques. @Lana Johnson. Well, Kyrgios or Dmitrov do look to be the next in line. However, both of these guys' forehands are more in line with striking with less amplitude and driving through the court. Kyrgios uses a quick high elbow prep and Dmitrov looks more like a push version of the Federer forehand. Both are prone to being streaky at times because it requires great timing. @Steve Pitkin: Yes, I agree that Federer's willingness to attack the net nearly produced the upset. It's about as age old as Laver venturing to the net against Rosewall, or Mac attacking Borg. Strategies and styles always make for a great matchup, especially on grass! Fed's lower amplitude game would seem to be better mated to grass. But I am afraid Fed's low amplitude backhand let him down in the end of the match. He just doesn't seem to pass down the line as well as he used to combat attacks to his backhand. @Austin: I would venture to say that their forehand windups geometrically create the most spin. Sure their anatomical build also add to the ability to create spin. Dolgo has a similar steep forehand swing path, between Nadal and Djokovic. I would measure how steep the swingpath is in comparison to other pros and go from there. Big serves are making there mark again. Federer's awesome location and willingness to play the net almost worked to upset Novak today. What an awesome match! Every element was used and tested between the two, So I'm all for the all-court players. Its a good point that ability to generate spin on dead-run defensively is vital. Nadal & Djokovic seem to be the most flexible (wrist, elbow, shoulder, core). Could be the prime reason for their rpms. Its not a coincidence that the most flexible guy Dolgopolov also generated a lot of rpms. @Austin: Insane defensive skills has to be directly related to the ability to hit spin under pressure, rather than hit with a flatter shot and risk the ball going out. Sure, you could say it is because of their physical attributes and their fighting spirit, but skill has to do with specific techniques. Shanking a la Federer is related to the inability to have enough open racquet face area due to the extreme Eastern grip. Federer is probably more focused under pressure at times than Djokovic. But, it's his swing style that requires so much focus.Djokovic can concentrate on angling the ball more rather than drive it straight. All players mentioned are fast and flexible. But the ability to angle the ball and make it kick outwards and away is what makes Nadal and Djokovic the most dangerous day in and day out rallyers on tour. If you simultaneously have all of the above 4, you cant be stopped. RPMs are secondary.